Even with a three-way mirror, it’s hard to get a good look at yourself from every angle while trying on clothes — not to mention, it’s hard to remember how they all look when you've been trying on one outfit after another. What if there were a better way to try on clothes? 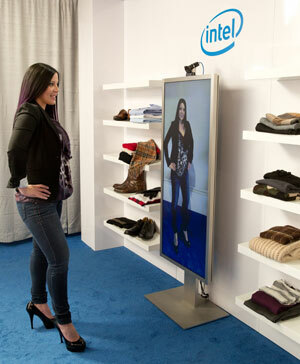 That’s the promise of MemoMi’s MemoryMirror with Intel® technology. Approach the MemoryMirror on the retail floor and it will take a 10-second video clip of the outfit so you can get a full 360-degree view without twisting and turning. The MemoryMirror can also play back multiple videos using intuitive hand gestures to help you choose the best one. When you’re done, you can save your outfits for viewing later with the MemoMi app. This lets you share the videos to get a second opinion from friends and family or even try different color options to see how they look. When you’re ready to make a purchase, there’s no need to go back to the store. You can buy your outfit right from the app. If you choose not to set up an account, your videos are automatically deleted. Check out this video to see the MemoryMirror in action.